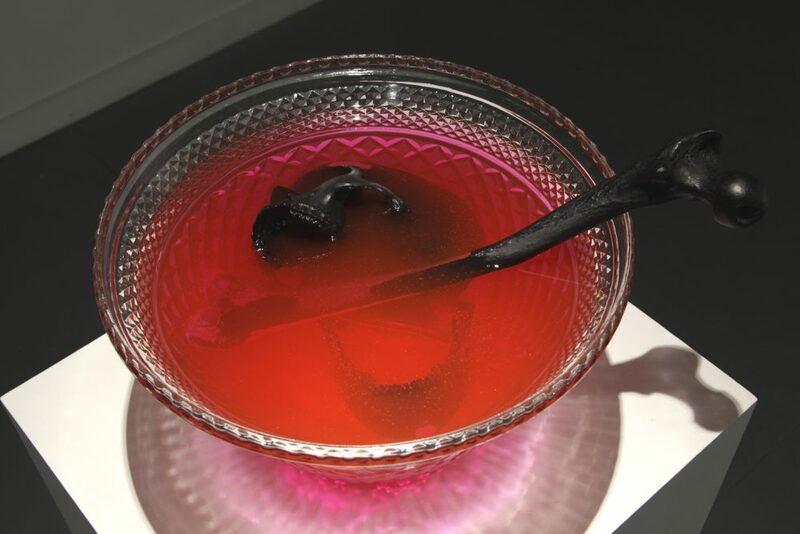 Ann Hackett contemplates the use of the color pink in protest movements and in Aaron McNamee’s recent show at Good Children Gallery. Installation view of Aaron McNamee’s “Pinkos” at Good Children Gallery, New Orleans. Courtesy the artist. Pinko: a person with liberal or left-leaning views. I know, crossing the threshold of Good Children Gallery, that I am walking into a room of fascist design. Lining the white walls of the gallery, Aaron McNamee’s pink banners hang from steel rods that jut out of the walls at right angles and terminate in cast-iron, cone-shaped finials. The stark geometry of these shapes, the banners depicting people’s faces—they tell me I’m in a place akin to Nazi Germany or Fascist Italy or Stalinist Russia. 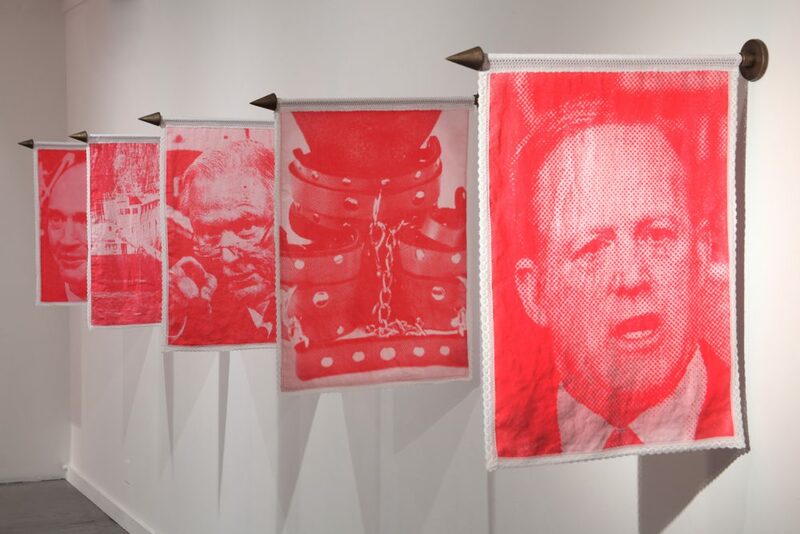 Each work in McNamee’s “Pinkos” displays the face of a member (or former member) of the Trump administration: Donald Trump, Mike Pence, Ivanka Trump, Jared Kushner, Steve Bannon, Rex Tillerson, James Mattis, Carter Page, Michael Flynn, Jeff Sessions, Paul Manafort, and Sean Spicer. And bordering each of their faces is a thin stripe of cream-colored lace. Pink is a red that has been stripped of its potency. When Jeff Sessions called the NAACP a pinko organization, I assume he relished the connotations of femininity and weakness. The color pink has long been embraced by the protests of the gay liberation movement and ACT UP, and it’s also been used as a symbol for contemporary women’s rights campaigns, including this January’s Women’s Marches and Code Pink’s recent visible actions. It has become the color of the resistance. The pink of McNamee’s banners is hot and brash, and the rose-hued Sessions, peering out at the viewer from his lace frame, inspires fear, and the sickle printed on the opposite side exacerbates that terror. A banner is such an uncomplicated expression of belief and support. We see them in high-school gyms, in frat houses, at church, and I ask myself where McNamee’s banners belong. Imagine sitting at an Alt-Right sewing circle sipping tea across from Tila Tequila. Or you’re with Kellyanne Conway at the Women’s March and the two of you are holding aloft a hot-pink banner with Donald Trump’s face printed on it. You’re in a place where left is right, war is peace, love is hate, and so on. Installation view of Aaron McNamee’s Punch, 2017, at Good Children Gallery, New Orleans. Urethane plastic, silicone, and glass. Courtesy the artist. As with Jeff Sessions/sickle, 2017, one side of each banner holds a face, and printed on the opposite side is an object. The connection between person and object is sometimes metaphorical as with Ivanka Trump’s samovar, a domestic object that calls attention to the vacillating roles she plays opposite the men in her life: CEO/wife, wife/daughter. Sometimes the connection is oblique. Tillerson’s object is a tractor, a reference to a favorite hobby: farming. And sometimes it’s literal. Donald Trump’s is a hamburger, a nod to his love of fast food; to his suggestion that the White House serve McDonald’s in lieu of state dinners; to Chris Christie’s infamous Big Mac delivery; or to any of the numerous times he’s mentioned McDonald’s, Burger King, Wendy’s, and KFC. If McNamee gets his news like I do, he’s reading it sentence by sentence in New York Times notifications, or catching bits and pieces of Rachel Maddow’s monologue from the next room over. But even if we spent each day reading everything we could about Trump and his people, it would be like listening to a radio signal that keeps cutting out. They may only show us fragments—a bulleted list of meaningless rules to live by, a swarm of contradictions, suggestions of an incredible criminal enterprise behind a bland, public face. In his new works, McNamee pins down whatever bits of news he can, but, like many of us, he’s grasping at straws to make sense of it all. When I speak with him, McNamee tells me he printed the images of these men and woman onto negatives, laid the negatives on linen painted with UV sensitive pink dye and let them develop in the grass. It was an act of discovery, watching Donald Trump’s face slowly ripen in the Louisiana sun, so the images are distorted in places, which reminds us that, even though we may look back on 2017 and tell a linear story of cause and effect, there is no narrative; there is no big picture. There’s just a man who, we can be reasonably sure, likes hamburgers. Aaron McNamee’s “Pinkos” was on view May 13–June 4, 2017, at Good Children Gallery (4037 St. Claude Avenue) in New Orleans.